In an age where we think we’ve discovered pretty much everything there is to discover on Earth, it’s particularly exciting when scientists discover a new geographical feature on the planet. What’s even more exciting is that this new feature is hidden beneath more than a kilometre of ice, and its discovery will lead to a better understanding of how the West Antarctic Ice Sheet is losing ice. During the 2009-10 austral summer, Dr. Robert Bingham, a lecturer in geosciences at the University of Aberdeen in Scotland, along with colleagues from the British Antarctic Survey (BAS), came upon a new rift valley beneath the Ferrigno Ice Stream in West Antarctica close to where the West Antarctic Ice Sheet drains into the Bellinghausen Sea while doing a radar survey traverse in the region. As explained in a recently published study in Nature, the newly discovered Ferrigno Rift – which reaches about a mile (1.6 km deep) below sea level – is answering a lot of questions as to why this particular region of West Antarctica is losing ice quite rapidly. Dr. Bingham explains to SciencePoles the Ferrigno Rift Valley and the significance its discovery has for getting a better handle on ice flow and ice loss in the region. How did you come upon this new rift valley? We discovered the rift valley while doing field work in Antarctica two years ago. Using a skidoo, we were hauling an ice radar device over the flat ice on the surface, and we found there was a massive rift beneath the ice, about a mile (1.6 km) deep. As we were examining the radar profiles, we were amazed to discover such a deep geological feature. We weren’t expecting to drive across something that was so spectacular and so deep. Where exactly is Ferrigno Rift located? It’s beneath the Ferrigno Ice Stream, which is not far from Pine Island Glacier, on the part of the West Antarctic Ice Sheet that drains into the Bellingshausen Sea, where the Antarctic Peninsula and West Antarctica come together. Why were you interested in doing a radar survey in this area? Were you expecting to find some kind of rift? We know from satellite measurements that this particular region has been experiencing a lot of ice loss. But we had no real idea about the topography of the bedrock beneath the ice. Bedrock topography is a key parameter when you’re trying to model how ice is being lost and the effect this loss might have on further ice loss. What kind of insight does knowing that this rift exists give you? In the paper that has been published, we plotted the path of the rift, and on top of that we plotted repeat satellite tracks (that’s where a satellite flies over a region, and then follows the same path some time later) that show an ice-thinning signal between successive satellite measurements of the ice surface elevation. The thing that’s quite striking is that over the last half decade, the thinning has taken place mostly along the trajectory of the rift valley. So we can see there is a relationship between where the rift is located and how the ice is thinning. The rift valley “steers” the ice-thinning further inland than it normally would otherwise – about 100 km more than it would otherwise. We know that this ice thinning is being forced by warm ocean water attacking the ice margin (the edge of the ice). But it’s only in certain parts of Antarctica that this gets translated further inland. We now know that this happens in the area of the Ferrigno Ice Stream because there is a deep rift below the ice, which shapes the bed beneath the ice to promote ice retreat. If you have warm water attacking the edge of the rift, would it eventually penetrate the ice at the bottom of the rift and lubricate between the ice and the bedrock, causing the ice to flow even faster? The water would only get to the bottom of the rift if the ice weren’t there. The ice forms a big wall. And when the warm water comes in contact with the ice and “attacks” it, it generally “attacks” the bottom of the ice cliff that’s in direct contact with the ocean. So it melts that. But the water doesn’t penetrate beneath the ice. It’s more that the overlying ice starts thinning, and this makes the surface gradient of the ice from the interior of the ice sheet to the coast steeper, which is what makes the ice flow more quickly. The seawater would get into the rift only after the ice in the rift had disappeared. But it would take several centuries before there would be total ice loss from this region. How does this region compare to other areas of rapid ice loss in West Antarctica such as the Pine Island Glacier or the Thwaites Glacier? The area of the Ferrigno Ice Stream is particular analogous to the Pine Island Glacier, which also has a rift lying beneath it that speeds up the flow of ice. Both have this topographic structure where the depth of the rift increases the further inland you go. This favours continued retreat, as long as the terminus is coming in contact with warmer water. As for the Thwaites Glacier, it’s not so similar. While it in all probability also overlies some rift structures, these rifts cut across at almost right angles to the flow of the glacier. At the Pine Island Glacier and the Ferrigno Ice Stream, the ice flow runs in the same direction of the rift, which makes them particularly vulnerable. Now that you know the rift exists, how will this help improve the models that are looking at ice loss from the West Antarctic Ice Sheet? We’ve known for some years that rapid ice loss is occurring around the West Antarctic coastline, and we’ve attributed this to ocean warming - or at least a change in ocean circulation that is bringing warmer water into contact with coastal ice. But this study brings these observations into context with the longer-term geological evolution of the region, which has “preconditioned” some areas of the coastline to be more vulnerable to the relatively recent ice-ocean interactions that we’ve been witnessing. Certainly if we’re trying to understand the evolution of the Antarctic Ice Sheet over millions of years –which is a useful exercise as we try and get to grips with the way the whole system works – knowing that these rift structures can sometimes significantly influence the response is an important thing to know. Does the Ferrigno Ice Stream terminate in a glacier and an ice shelf? There really isn’t an ice shelf coming off the Ferrigno Ice Stream, which is quite an interesting feature. 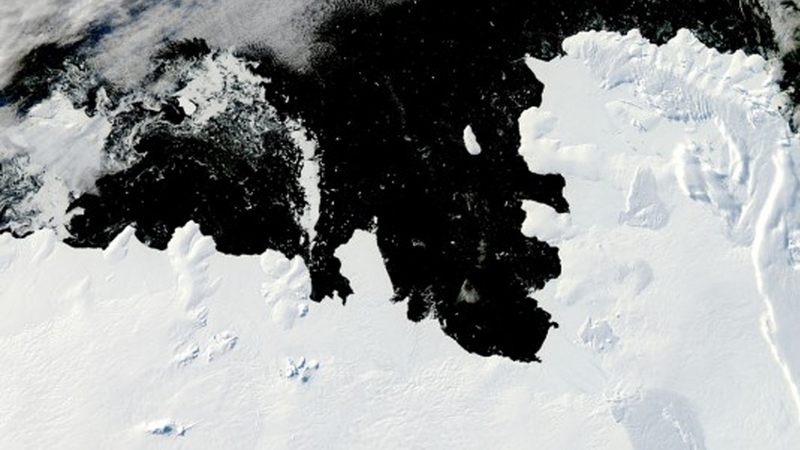 There are commonly ice shelves around the Antarctic coast line. There has been some discussion in the polar science community about why there isn’t one there. The idea is that there probably was one there in the past, but that it’s already been removed by warm ocean water. So this is an indication that warmer water is getting to the coast, or that certain oceanographic conditions are present in front of Ferrigno Ice Stream that aren’t amenable to maintaining an ice shelf structure today. Is there any evidence that there was ever an ice shelf? Sediment deposited via ice flow was recovered during a cruise in Eltanin Bay, in front of the Ferrigno Ice Stream. That’s pretty solid evidence that there was an ice shelf there in the past. But we don’t know when the ice shelf existed, nor when it disappeared. It happened before satellites began to capture imagery around Antarctica, so there’s been no ice shelf there since at least the early 1970s. There have been a number of satellite measurements in the region of the Ferrigno Ice Stream. But have there been many in-situ measurements taken there? There has only been one previous visit to the region to report, and that was during the traverses the United States did in Antarctica just after the International Geophysical Year (IGY) 1957-58. So it was in 1961 that the region was last visited on foot and in-situ measurements were taken. What kind of measurements did they take at the time? They didn’t have radar to penetrate the ice back then like we do now. They took some rough measurements in five different locations in the region using explosives. Explosions produce seismic waves which you can use to get a rough idea of the topography underneath the ice. But they were there for a few days at most. And with the limited information available then, and a lack of knowledge about ice streams that has subsequently come from satellite monitoring, the traverse party didn’t know then that they were driving across an ice stream. The lack of understanding of the topography of the bedrock in the region was my main motivation for going there. How long has this region been monitored? In terms of monitoring the inland ice, there has been negligible monitoring. There have been a couple of oceanographic cruises in the region over the last 10 years that have taken measurements of ocean temperature and measured and retrieved seabed sediments. So in some ways our offshore knowledge was better than onshore. In the same year we visited the Ferrigno Ice Stream, NASA’s Operation IceBridge also over-flew the region and obtained some useful measurements near to the coastline, where we couldn’t travel because the ice-surface has too many crevasses. Yet besides our measurements we took there in 2010, those of NASA, and the ones taken by the Americans in 1961, the only other reference we have are satellite images that have captured the area. They go back as far as the 1970s, but they only see the surface, and the resolution is poorer the further back in time you go. This is why it’s important to do in-situ radar surveys. We’ve got these satellite images of the region, but they only tell us what’s happening on the surface. Have you used measurements from ESA’s CryoSat-2 satellite in monitoring the region at all? We haven’t used any measurements from CryoSat on the Ferrigno Rift Valley region. Two years ago when I went, the satellite hadn’t been launched yet. I had been using data from a similar US satellite, ICESat. But when CryoSat measurements become more readily available, we’ll have more detail around this coastal area. It will be of immense use. They’re still calibrating the output from CryoSat, so it hasn’t been released widely into the scientific community. CryoSat will be a powerful tool once the CryoSat community is satisfied that the measurements are good enough for wider use. It was the same story with ICESat when it was launched. You often have a period before satellite data measurements are released to the community on a wider scale; this allows time for the measurements to be calibrated, which is vital before they should be distributed for wider use. You mention that the feature is an ancient rift basin. Do you know anything about the geology of the rift basin, and how old it might be? We know that there is a big rift system called the West Antarctic Rift System that traverses West Antarctica beneath the ice. The whole rift system opened up before there was any ice cover over Antarctica, at least 34 million years ago. The vast majority of geological evidence we have for this system comes from mountain outcrops in the area beneath the Ross Ice Shelf on the opposite side of Antarctica, close to the American McMurdo base. The area where we were doing radar profiles was hypothesized as being at the far end of the same rift system. But because there are no rock outcrops in the Ferrigno Basin, it’s very difficult to make a firm estimate on how old the rift is, or how it has evolved relative to the rift zone areas we know better in East Antarctica. Do you plan to do more research in this region? There are no plans to go back next season. The paper we published shows the region is important. I don’t know exactly when I might be able to go back, but I hope to go back. I’m quite keen on following this up and finding out more about where the rift goes. What we’ve uncovered with the radar is really a small part of what lies beneath the ice. It’s an interesting area to study. It’s largely evaded attention due to the fact that it’s relatively close to the Pine Island Glacier, which is a much bigger science target. In the meantime, I’ll be going to the Pine Island Glacier during the 2013-14 season. The UK’s Natural Environment Research Council (NERC) is funding a traverse expedition in the region over two consecutive austral summer seasons starting in 2013. I’ll be going for three months during the first season, taking ice radar measurements to get a good idea of subglacial topography over a large part of the catchment area (the area of ice the glacier drains). There will be others on the expedition taking detailed measurements of snow properties and ice surface properties so we can calibrate the measurements we’re taking from satellites. Do the Ferrigno Ice Stream and the Pine Island Glacier influence one another, being in such close proximity to one another? They would, because they’re adjacent to one another. If ice starts to disappear from one area, it will definitely have an effect on the other. But probably the main cause of ice loss from either one of them is going to be a warming sea. So any influence they have on one another would be secondary. Any ice flowing into either one of them is coming from the same direction, the interior of the Antarctic Ice Sheet. A veteran of everal Antarctic expeditions, Robert Bingham is a glaciologist and lecturer in geosciences at the University of Aberdeen in Scotland. His research focuses on large ice sheets and what is making parts of them lost mass.